Spending on Adwords with Poor Results? for your free Adwords Audit report. Do you use 2 text Ads? Do you split-test your advert copy? you missing the testing trick? and commas can make a 20% difference. Do you know your Negative Keywords? Stairway was a relevant keyword for a handrails campaign but the 'stairway handrail' search volume is still swamped by Led Zep fans adding 'heaven', 'mp3', 'lyrics' etc. Negative keywords can increases your click-through-rates & saves cash. Do you know how your Ad Position affects Conversions? Do you bid for the top position? A company increased their bids to double their traffic but paid 5 times as much! Some markets convert best at position 1 but many more convert better at positions 2 & 3. 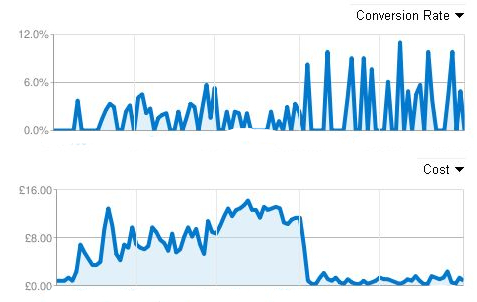 Since 2011, double-length headlines have seriously increased the clicks & conversions from above the free search results, see below. Do you know how to view your Quality Scores for Keywords? Your quality score relates to your click-through-rate, historical performance and your landing page & immediate pages. Poor keywords can drag down your group. See how to find & improve your Adwords Keyword Quality Scores. Display Network or Search? Do you know when to use them? The display network bids work in very different ways to bidding on searched for keywords. Your Content adverts appear next to related news and information pages so need to divert attention away from the content which is why image and dynamic Ads are common here! Display Ads are good for product launching or new ideas that consumers have not yet heard of. Never use the display network before you are tracking conversions well! Google provides tools to track your clicks, click-through-rates and spend. These just optimise your payments to Google. Google also provides conversion tracking: of sales, leads or other desired outcomes. You should know your cost of conversion and its value to you. Simple website changes can double or treble your sales for the same spend! 250% more conversions for 93% less cash! Do you bid on your Own Brands? Google now allow your competitors to bid on your brand in the UK & Ireland. You cannot use competitor brands in your adverts and bidding on a competitors brand is not easy to do well. Bidding on your own Brand is the safest, least expensive, way to try Adwords. Bidding on you own brand also will increase the costs to the competition if they try to bid on your brands. See new bidding on failed competitor names page. from 1.72% to 5.4% whilst the cost per click has dropped from over 10c to 4c. More importantly the campaign has delivered verified phone orders. Thank you for your help." Mr Armoutis, Armyland.gr. with 8 mandatory fields in our Quote form. Adwords works perfectly with our new Call-to-Action button." Terri. "Following your suggestions has doubled our Conversion Rate! Halving c.p.a. Thinking about it we've doubled our free visitor conversions too!" Simon T.
"Thank you for your help promoting our MSc courses using Google Adwords. Your advice about improving conversions has clearly worked generating 250% more prospectus requests and is helping to guide our website re-launch." "People were still looking for the old N.T. version of the brand." William. "When they see your simple Ad, customers know they have the right Nova." "When you don't bid on your brand it's easy for competitors to steal traffic. Your Brand runs through your site like Blackpool through seaside rock so your 10/10 Quality Scores will deliver clicks for pennies & increase competitors bids to £1 - £5". Rob.